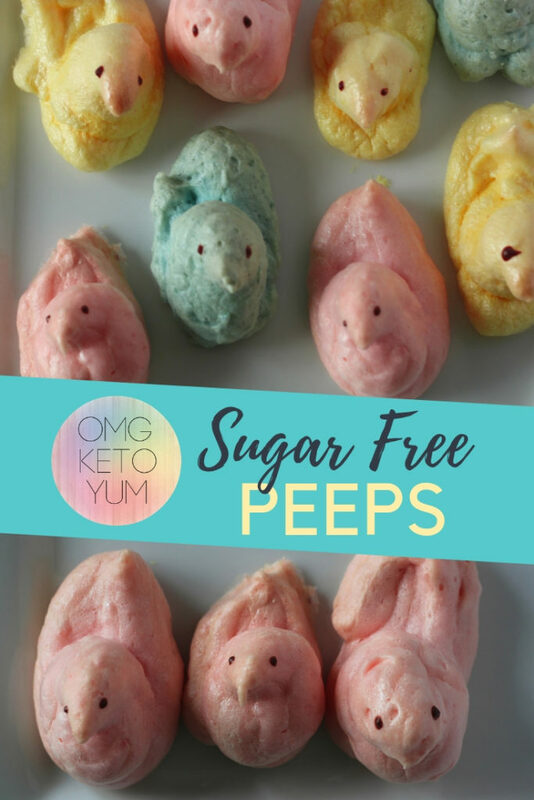 Sugar Free Peeps : Low Carb Peeps for your Keto Easter! 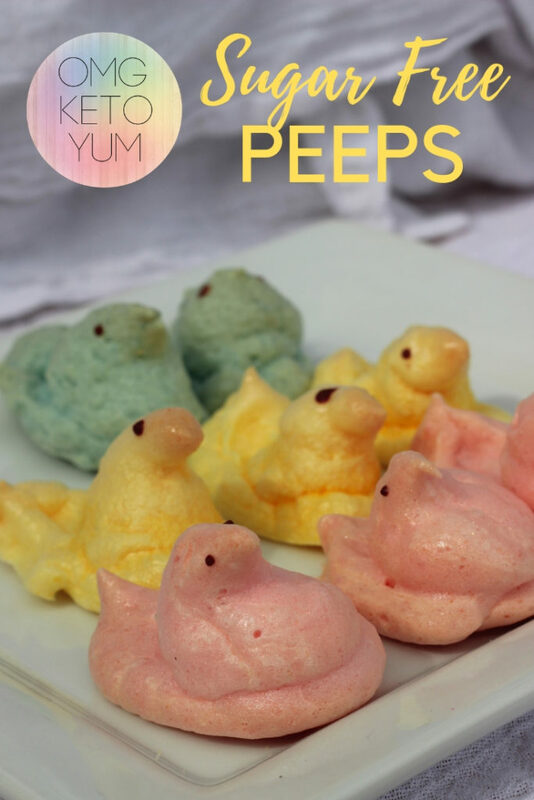 This Sugar Free Peeps recipe is colorful and in other words totally out of this world. Who does not love peeps? 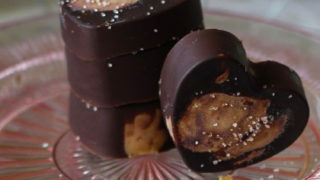 Ok, let’s be honest Peeps are one of those foods that people either love it or hate it. I fall into the category of LOVING peeps! 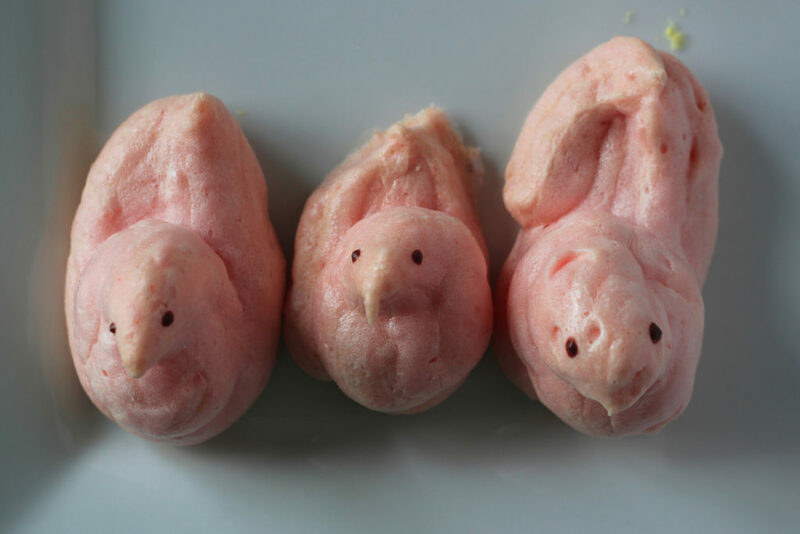 My body can’t handle the sugar that are in traditional peeps and for that reason I created these low carb Peeps. 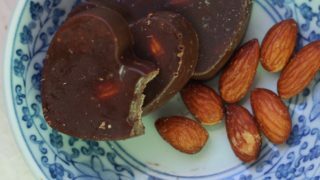 I hope you love this recipe and make them for your family this Easter and keep it Keto! But wait, you can buy Sugar Free Peeps right? 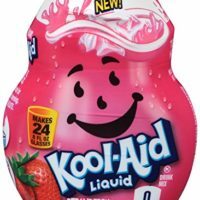 Yes, you can purchase Sugar Free peeps however they contain Maltitol which can have almost the same effect as sugar on your body and cause gastrointestinal discomfort. 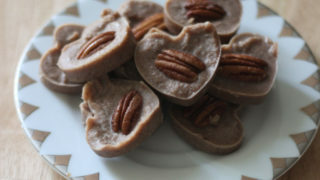 Do I need a fancy mixer to make Meringue cookies like the keto peeps? 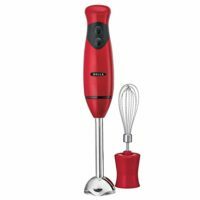 Nope, I use a simple hand mixer with a whisk attachment. 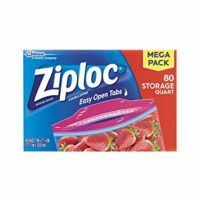 It was under $20 and I use it every time. There was a sale on Monk Fruit Recently and for that reason I purchased my hands on a bottle of pure Monk Fruit Extract. and let me tell you I sure do love it. I have tried a lot of non sugar sweeteners before and Monk Fruit is hands down my favorite. 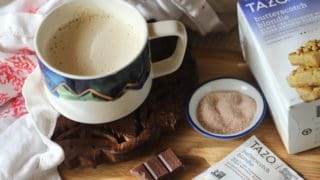 This recipe calls for only 3/8 of a TSP of Monk Fruit Extract which is the equivalent of 2.23 cups of white cane sugar. 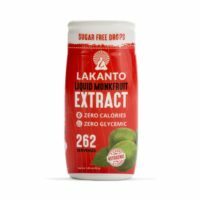 Monk Fruit extract has zero impact on your blood sugar and it tastes so good!! 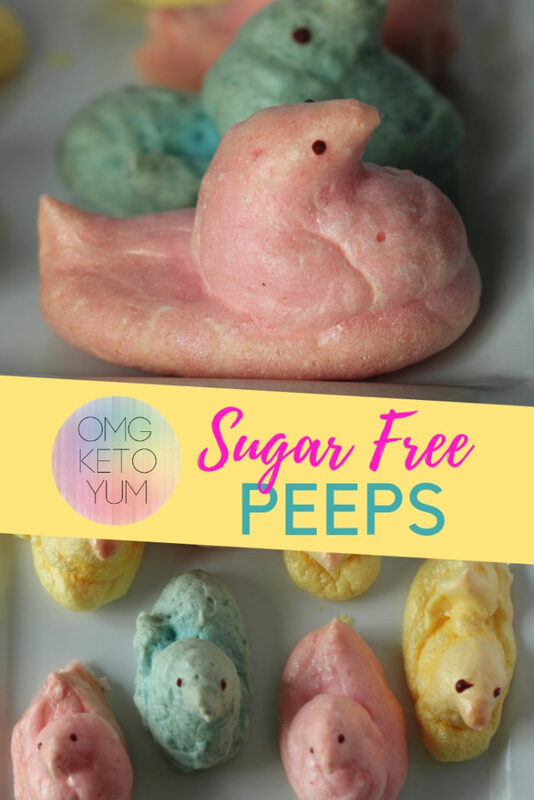 Ok, this took me a while to master and as you can see, not every keto peep is perfect. I joke that the blue ones look drunk and the yellow ones look like they got in a car wreck. 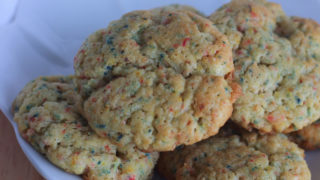 Just remember that even though they may not look perfect they will still taste amazing and stay low in carbs. 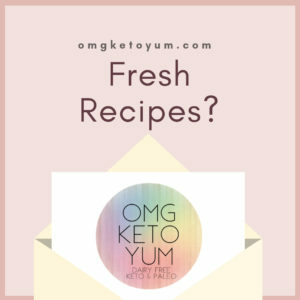 I found this video extremely helpful to learn how to pipe keto peeps. I used a ziplock baggie with the tip cut off to pipe these little guys. 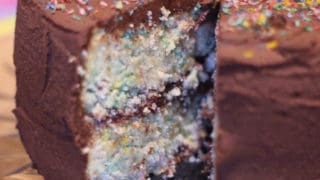 Skip to the 4:27 Mark for the piping action! 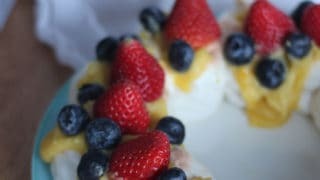 For more low carb Meringue recipes check out my Keto Pavlova with Lemon Curd or my Ghost Meringue Cookies that are perfect for Halloween! 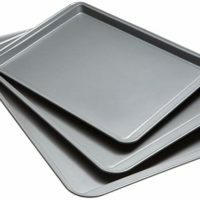 Make sure that the glass or metal bowl that you are using is clean and dry before beginning. If there is any grease or residue on your bowl then your meringue will not come together as well. Add the Egg whites to the bowl and using a hand mixer with a whisk attachment start to whisk the eggs. 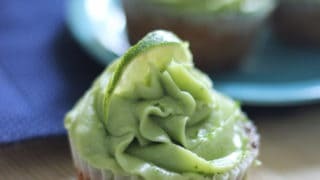 Keep whisking until peaks start to form. 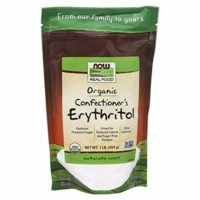 Add the Monk Fruit Extract and Erythritol if using and continue to whisk until stiff peaks form. Add the liquid drink enhancer of your choice to the egg whites and mix. 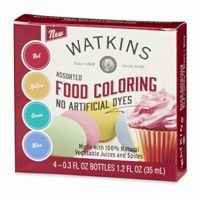 Add food coloring if you are not satisfied with the color. 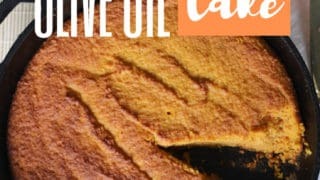 Add the zanthuim gum slowly while still whisking the meringue. 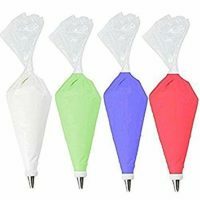 Stop whisking when the meringue wraps around the whisk and you are able to turn the bowl upside down and nothing falls out. 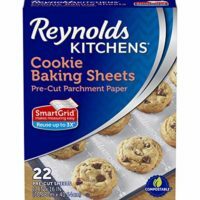 Load up a piping bag or a ziplock bag with the meringue and pipe onto a cookie sheet and bake for 2 hours at 180 degrees. 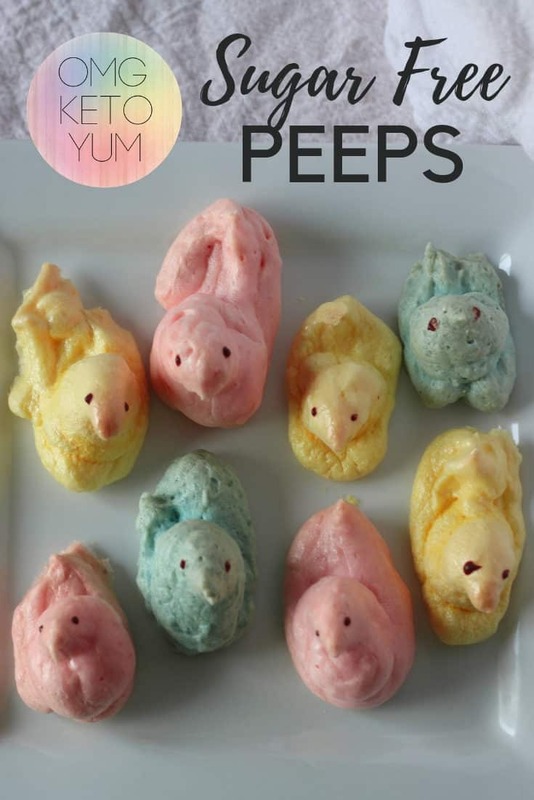 Let the peeps cool for about 30 minutes. 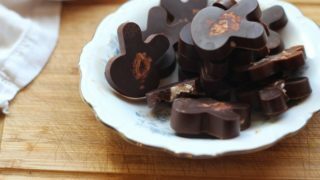 Melt a bit of keto friendly chocolate and using a toothpick dap eyes on the peeps. Enjoy! Happy sugar free Easter!! Feel free to use a different drink mix for these peeps. 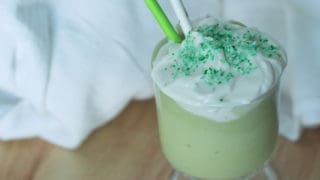 If you do not use a drink enhancer then the peeps will just be sweet which is not a bad thing. 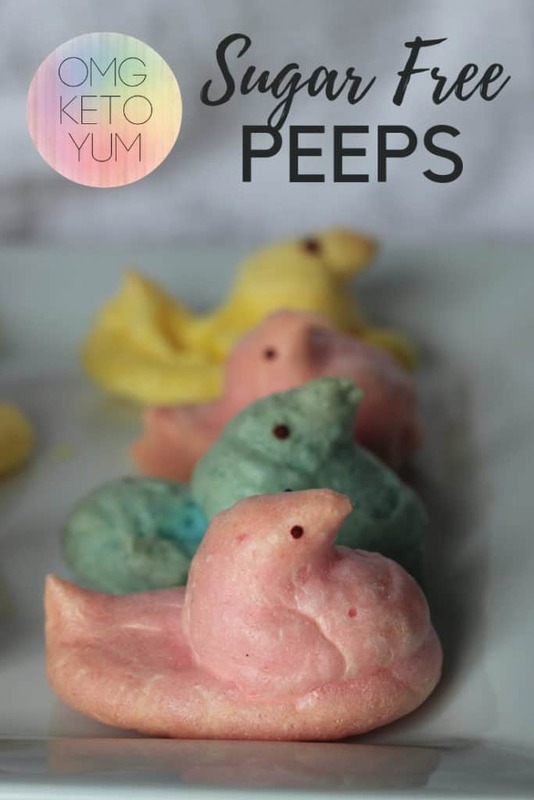 I have also made these peeps using lemon juice as a flavoring and they turned out great! 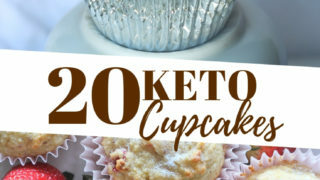 For more Low Carb Cakes look no further! 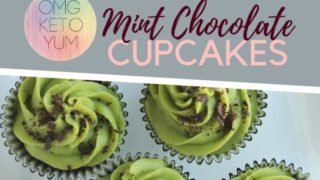 If you love this recipe share it on Pinterest and comment below because sharing is caring!